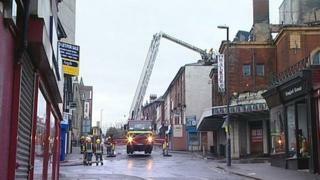 Two men have been arrested on suspicion of arson following a fire at a theatre in Derby. Crews from six stations were called to the fire at the Grade II-listed Hippodrome in Green Lane at about 03:30 GMT on Saturday. Fifteen people were evacuated from nearby homes and a large part of the city centre had to be closed off. The men, aged 19 and 23, remain in police custody and will be questioned later. An area around the former theatre remains cordoned off due to concerns about the part of the building's structure. The building had been left derelict after being badly damaged three years ago. Supt Gary Parkin, from Derbyshire Police, said: "The building has been looked at by structural engineers from Derby City Council and this week there will be another examination to see if it is stable."